When it comes to sports tracking, things don't get more action packed than the Garmin Fenix 3. Designed for the person who's not content with a little weekend jogging, it's capable of tracking trail running, skiing, open water swimming and even gym work to name a few. In short, the Fenix 3 is Action Man's wrist-based companion. You'd expect no less considering the eye-watering price of $599 for the Sapphire version we tested – and the big standard edition still commands $499. But can it out-perform the latest wearables from the likes of Fitbit? 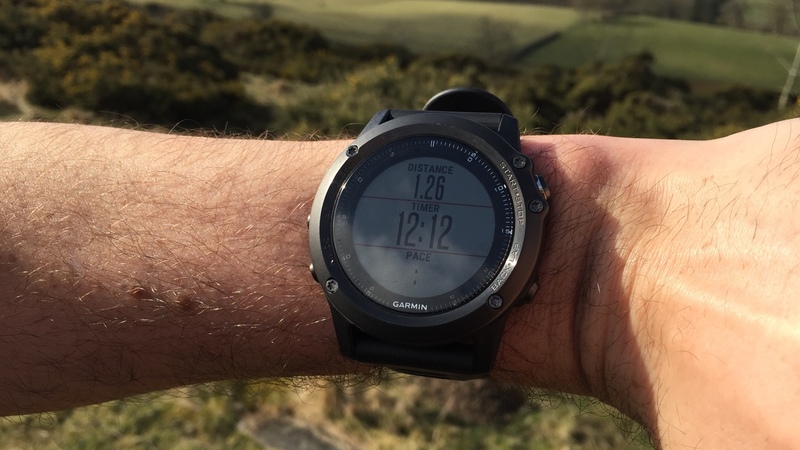 And with prices plummeting for its predecessor the Garmin Fenix 2, is it worth forking out for? We got it dirty to find out. The previous Fenix was one of the chunkiest sports watches we've ever used, and while the Fenix 3 is still fairly enormous, it's been on a substantial diet. We tested the Sapphire version, which retails for a whopping $599, and benefits from a toughened lens and a metal strap. At 16mm deep and 82 grams (sans strap), it's shed over 1cm from its waistline compared to the Fenix 2, but it's still a hefty piece. The weight hasn't changed much, and most of the bulk is the battery, and its longevity is one of the Fenix's killer features. The Fenix 3 will last five weeks as a watch, and last 20 hours using GPS (and up to 50 hours in lower power hiking mode). However, when combined with the metal strap, the weight soars to 186g, and it's almost unmanageably heavy. Luckily, there's a rubber strap in the box which we immediately swapped it for. It's a shame as the metal band looks great, and offers a much classier appearance. Users with chunkier arms might well keep the metal strap, but the rubber is more practical for sport, and we hazard that most will end up keeping that in situ. That slightly undermines the premise of the Sapphire edition, and makes us feel that saving $100 and getting a standard Fenix 3 is a smarter choice. The insane battery life means you can track a whole weekend's worth of hiking without taking the charger with you, and ultra-runners won't trouble the limitations of the battery. Of course, the five weeks of battery is diminished quicker by the smartphone notifications, which is a new addition to the Fenix range. Like the Garmin Vivoactive, push notifications – calls, texts, Uber updates, SkyBet's desperate pleas – are all displayed on the wrist. Of course, battery life is helped by the 218 x 218 'colour' screen, which is designed to be 'transflective', which means it's still visible in direct sunlight. Colourful it certainly isn't - occasionally you're treated to a red or green arrow to aide navigation. The screen itself is incredibly dull, but certainly easy to view when you're outside in the open. At night, you'll need to press the backlight button at the top left to illuminate it, briefly. Some may choose to wear the Fenix 3 as their main watch – we didn't mostly due to its cumbersome size. Yet, if you do, you'll be able to access daily step information, which is fed into the app. It will also track your sleep if you wear it to bed, although the experience of sleeping with the Fenix attached to your arm made us feel for Terry Waite, who slept chained to a Lebanese radiator for four years. Sleep tracking is very limited, and you simply get a graph showing the hours you spent in bed, but at least that part was accurate. The graph also shows how much you moved in that time – but frankly, who cares? With tracking for hiking, climbing, cross country skiing, train running, running, cycling, swimming, open water swimming, skiing, indoor workouts and triathlon, the Fenix 3 is a frankly amazing sports watch. Disregarding the more niche sports, in many ways the Garmin Fenix 3 isn't too different to the Vivoactive smartwatch. Both have a range of multisport tracking, GPS, and smartwatch features – but it's the breadth of data from the Fenix 3 that stands it apart. Each sport boasts an awesome range of data, and up there with the best GPS running watches on the market – the list of metrics tracked across the sports is too comprehensive to go through here, but check out the list to the left. Aside from general pace and distance data is information on heart rate, VO2 Max, recovery, as well as cadence and vertical oscillation, and that's just for running. What's more, there's a built-in compass, and your progress for walking and climbing is plotted on the watch, so you can see your current heading, and the path you've plotted, which is handy when you want to complete a circular hike – or indeed, avoid going around in circles. The only caveat is that to access heart rate stats, you will need to pair the Fenix 3 with a chest strap, as unlike bands like the Mio Fuse or Fitbit Surge, there's no optical tracking from the wrist. This is still a problem area for the whole sports tracking industry. The most accurate way to track advanced metrics such as heart rate or body position is still by a chest strap, yet it's uncomfortable and ungainly. However, looking around the market, there's little serous competition to the Fenix 3's versatility and accuracy from any of the new pretenders – even from the likes of Mio. When you're out on a run or cycle, the information is displayed over three screens, which you use the physical buttons to cycle through. We tended to settle on the distance and pace screen, but if you're training using heart rate zones, there's a screen for that too. Unlike the Vivoactive, the data is displayed more clearly, with big numbers that are easy to glance at your stats while you're in the zone, and the big hefty buttons on the side are easy to press mid-stride, and we were comfortable making tweaks while out on the trails. Of course, when you get home you'll want to review your stats, which means firing up the smartphone app. Fortunately, the Fenix 3 has been given access to the Garmin Connect mobile app, which s available for iOS and Android. The app itself is superb and certainly one of the best in the business. What's more, there's a web-based version with a host of options, from plotting running routes to taking on your friends in challenges to earn badges. The mobile app is extremely well laid out, and for the most part, seamless to use. Everything synced quickly and easily, without the frustrating limbos we've experiences using other fitness trackers. All workouts are laid out in chronological order, and you can quickly delve into stats, which are tabbed across the top, so it's not too overwhelming. At the moment, there's not a great deal of analysis within the app, and you'll need to rely on your own experience to decipher the data. With the built in compass, you can set up advanced workouts using the online Garmin Connect before you head up, and have the watch guide you on waypoints, which really helps when out on the trails. A new addition to the updated Fenix 3 is smartwatch style notifications. When paired with your smartphone – and in range – any notification will flash up on the watch, and prompt you with a buzz. It's a decent system, and it works well – no matter which applications you use. However, it doesn't work as well as the Gamin Vivoactive, partly because of the decreased screen legibility, and because notifications can be split across multiple screens, requiring you to hit the down button to read the second half of the message. Again, it comes back to whether you intend to wear the Garmin every day. As a smartwatch it's not terribly effective, but if your phone starts ringing in the middle of a trail run, it's extremely handy to see whether it's worth answering or ignoring. In short, the Fenix 3 is the ultimate fitness watch, and one that comes highly recommended. There’s enough top level data for hardened triathletes and casual fitness fans who enjoy a diverse range of sports will get a kick out of seeing every activity tracked within one superb app. The impressive battery life crowns the Fenix 3 as a top sports watch, and while the smartwatch notifications aren’t the best, they combine with the activity tracking to make a watch you could wear every day.